You can use a Data Validation Input Message to display a message when a cell is selected. However, the font can't be changed, nor can message box size be controlled. To overcome these limitations, you can create a text box to display the message, and use programming to make it appear if cells that contain a data validation Input Message are selected. NOTE: The technique shown here will only show the input message text, from the data validation setup window. If you want to show a longer message, download the Long Message sample file. NOTE: For a similar technique, that shows a message when non-data validation cells are selected, download the Selected Cells Message sample file, in the Downloads section. The next step is to create the data validation dropdown lists. Message: Please select the weekday in which the product was originally purchased, not the weekday in which it was first used. If you are not sure, please leave this cell blank, then check with your manager, and fill in the weekday later. Message: Please select the month in which the product was originally purchased, not the month in which it was first used. 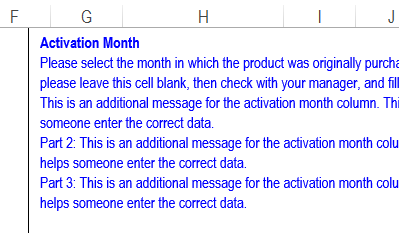 If you are not sure, please leave this cell blank, then check with your manager, and fill in the month later. On the Drawing Toolbar, click the Text Box tool. 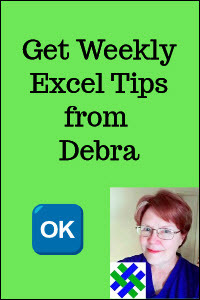 Draw a text box at the top of the worksheet, large enough to hold your messages. Type some sample text, e.g. "This is the Input Message"
Format the text box with the font and font size you'd like. Visual Basic for Applications (VBA) code is required to make the text box appear when you select a cell that contains a data validation input message. It copies the data validation Input Message and Input Title to the text box, and makes the title bold. Right-click on the sheet tab, and choose View Code. Select one of the cells that contains a data validation input message. The data validation input message is limited to 255 characters, so the technique show above is subject to that limit too. If you need to show longer messages in the text box, you can download the Longer Message sample file, from the Download section, below. This example uses most of the code from the original example, and adds a new feature. There is a worksheet where you can enter a list of Input Message Titles, and the message that you want to display for each of those titles. 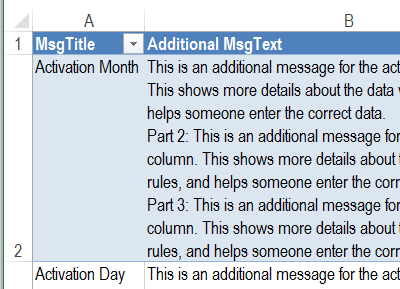 When you click on a data validation cell in the Longer Message sample file, the Input Message title is used as a lookup in the messages table. If there is an entry for that title, the Additional Message text is added to the end of any existing Input Message text. Then, the entire text string is shown in the text box at the top of the worksheet. So, with this version of the sample file, you can display much longer messages when someone clicks on a data validation cell. You'll have to adjust the size of the text box, to fit the longer messages, or reduce the font size, so more characters will fit. For short messages (the technique described in the instructions above), download the zipped sample file. This file is in Excel 2003 format (xls), and contains macros. For longer messages, download the Long Message sample file. This has an extra sheet where you can enter longer messages, and they will be displayed in a text box, based on the data validation input message's Title. This file is in Excel 2007 format (xlsm), and contains macros. For messages that appear when a specific cell is selected (not a data validation cell), download the Selected Cell Message sample file. This file is in xlsm format, and contains macros.